My interactions with Rob have left me with a state of wonder and awe. Rob consistently goes above and beyond to meet the needs of his clients, and is a master at consistent communication throughout each part of the process. He makes sure you are confident in the quality and consistency of the delivery he gives to his clientele. It makes me think why anyone else would bother to see out SEO and Internet media services elsewhere, when they can find it all with Rob Cushing and his company Port & Starward. Highly recommend if you are ready to take your business and Google page rankings to the next level! Rob is a beast when it comes to Search Engine Marketing! We previously worked together for our SEO and his insight & expertise truly shined through. As a few problems popped up he knew exactly to provide the best solution. 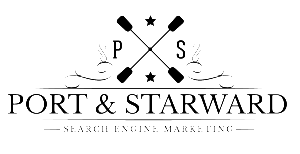 If you get the opportunity to work with Port & Starward, I’m confident they will be a true asset for your business! Rob is a leader in the SEO Community. His knowledge goes beyond scraping the barrel for general information and puts him at a distinct advantage. If you get the chance to partner with him, do it! One of the things that stands out about Rob (and his team at Port & Starward) is his ability to deliver to his clients the results they are looking for – high rankings in the search engines and more traffic to their business. His results speak for themselves and his wealth of knowledge of SEO is quite outstanding. I highly recommend Rob as someone who will rank your site with authority and integrity. Once in a while, you run across someone who immediately stops you in your tracks. Here’s someone who possess not only a real skill set in SEO and search engine marketing, but also a real desire and drive to work closely with his clients AND deliver above and beyond their expectations. That pretty much sums up Rob and his team at Port & Starward. If you’re seeking a real boost in your businesses’ page rankings (and as a result, leads and sales) you need to give him a call TODAY. After working alongside Rob on a number of projects I found him to have an amazing ability to work through problems both methodically and with speed, his knowledge regarding internet marketing technicquest that work is second to none as well as being easy to work with. An extremely capable and results-driven master of SEO and Internet media, Rob Cushing at Port & Starward absolutely dominates his craft. He has such a level of knowledge, works closely with his clients, keeps them constantly updated on his progress and has proven his worth with the results his clients see, particularly with the great increase of business, sales and leads they see! He not only gets his customers ranked on the first page of Google, but better yet, KEEPS them there, and it pays off for them in droves. Rob has my highest recommendation! I got to mix it up with Rob during a project group gathering for SEO. He knows his stuff and brought solid ideas to the table. I will continue to keep him in my book and recommend him to anyone struggling to get a return from their online investment.